Sunset for Sparc64 in SMP servers? Exclusive The relationship between Oracle, acquirer of the Sun Microsystems server business, and Fujitsu, licenser of the Sparc instruction set and maker of its own Sparc iron – you can't even call it clone iron since Sun and then Oracle have been selling the Sparc Enterprise M systems for years – has been particularly inscrutable for the past two years. 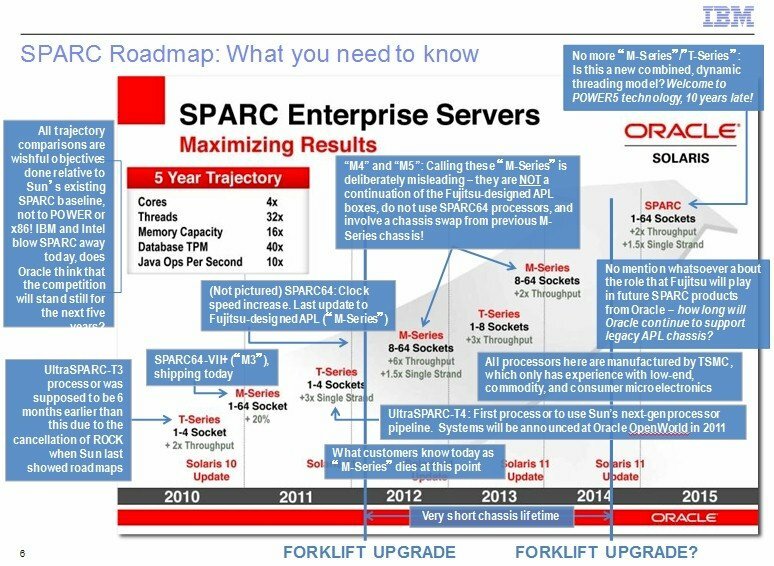 But Oracle has inadvertently cleared up one of the mysteries of its future Sparc processor roadmap. Up until now, Sun and then Oracle designed the Sparc T series processors for entry and midrange systems and Fujitsu designed the Sparc64 processors and Sparc Enterprise M machines. Both companies were allowed to resell each other's kit and while they never admitted it, there appeared to be an agreement back in the Sun days of the partnership to let Fujitsu lead in Japan and Europe and Sun lead elsewhere. Rather than collaborate on a converged Sparc family of systems, Oracle and Fujitsu pursued different agendas in the server racket, with Oracle concentrating on its engineered (and clustered) systems and Fujitsu concentrating on big SMP systems and now, with the K supercomputer and its follow-on, the new PrimeHPC FX10 line, the traditional HPC market. Oracle and Fujitsu have been peddling SMP machines based on the Sparc64-VII+ processors crafted by Fujitsu, which Oracle calls the Sparc M3 processor. Oracle has promised to get a Sparc M4 processor into the field next year in systems, and Fujitsu has been absolutely quiet. The feeds and speeds of this M4 chip have never been divulged, and in fact neither Oracle nor Fujitsu have ever said they were working on this M4 chip together. They simply refused to talk about it, even as Fujitsu rolled out the eight-core, 2GHz "Venus" Sparc64-VIIIfx processor for the K super nearly two years ago, and even now as Fujitsu has begun talking about the 16-core Sparc64-IXfx processor used in the PrimeHPC FX10 line that will start shipping in January 2012, the companies have been mum about the Sparc M4 chip and if it would be a derivative of the Fujitsu chips. El Reg got its hands on this chart in the wake of the OpenWorld launch of the Sparc T4, but considering its source and the lack of comment from Oracle, and the fact that this was the same presentation that claimed that IBM's Power7+ processor implemented in 32 nanometer processes "is just around the corner" when it just isn't. So take this all with a grain or two of salt. And, a number of El Reg commenters have been saying the same thing for the past year, but no one at Oracle or Fujitsu would confirm or deny what the future Sparc M series chips would be – or what they would not be. Assuming Oracle would want to spend as little money as possible on big iron, we assumed Oracle would let Fujitsu do all the work, as it has done since 2004 when it pulled the plug on the "Millennium" UltraSparc-V processors and then suffered the humiliation of killing off the "Rock" UltraSparc-RK processors in 2009. In a briefing with El Reg to discuss the Solaris 11 launch, we pointed out that while the logical domain (LDom) partitioning technology on the Sparc T series was good and competitive with anything in the RISC/Unix and x86 server spaces, the dynamic domain hardware partitions used in the Sparc Enterprise M machines were a little bit rigid by comparison and that Oracle had to do something to bring LDoms to the future M4 processors. Not to worry, said Markus Flierl, vice president of Solaris engineering. "The future M series systems will be based on the same cores as the T series systems," Flierl said in defense of Oracle. (He said system not processor.) El Reg asked for absolute clarification that the M4 chip was not being designed by Fujitsu and was not a derivative of the Sparc64-VIIIfx, and the Oracle spokeswoman clamped down on Flierl like a vice and said that the briefing was not about hardware, but software. According to Oracle's latest Sparc roadmaps, the Sparc M4 processors will span from 8 to 64 sockets, like the current Sparc64-VII+ chips from Fujitsu do in the Sparc Enterprise M frames. The M4s are expected to offer six times the throughput and 1.5 times the single-thread performance of the current M3 chips. The M4 chips were being tested at the end of September and have already had Solaris 11 plunked on them to tweaking and testing. They are expected to be delivered in a new line of systems next year. There is very little chance that the M4 chips will be socket compatible with the current Sparc64-VII+ (aka M3) chips made by Fujitsu, but anything is technically possible. The M4s probably will not be compatible with the T3 and T4 sockets, either. For the Sparc M4 chips to scale from 8 to 64 sockets, Oracle has to add SMP ports to the chips and a lot more pins. It is far more likely that Oracle has dusted off the designs for the "Supernova" servers that were intended to use the ill-fated UltraSparc-RK processors and revamped them to use the forthcoming Sparc M4 processors. It is significant that the new Sparc T4 processors announced in late September sport the new "VT" core that was under development at Sun prior to the acquisition and that these cores have out-of-order execution, significantly boosting their single-thread performance. (That core is not called S3 outside of Oracle, but it is the same thing.) The Sparc T4 chips also have very reasonable clock speeds, at 2.85GHz and 3GHz, on their eight cores and eight threads.